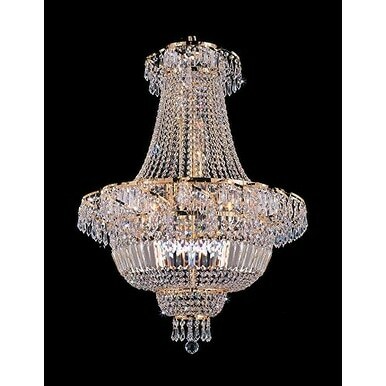 "French Empire Crystal Chandelier Lighting - Great for the Dining Room, Foyer, Entry Way, Living Room! H30"" X W24" This beautiful Chandelier is trimmed with Empress Crystal(TM) CRYSTAL CHANDELIER, this Empire chandelier is characteristic of the grand chandeliers which decorated the finest Chateaux and Palaces across Europe and reflects a time of class and elegance which is sure to lend a special atmosphere in every home. Shipping 29 Size : W24"" H30"" Lights : 9 Lights Please note this item requires assembly. Lightbulbs not included. Please note, when you purchase an item from the Gallery you can be assured of the ""Gallery 4 Points of Confidence"": 1. Each item comes with a Certificate of Authenticity, certifying this product is an authentic Gallery lighting fixture. 2. Each item comes with a Gallery backed warranty (Established 1978). 3. Each item will include Gallery verified and approved diagram and instructions. 4. Each purchase is provided with a toll free number for free Gallery tech support. Requires (9) 40 Watt candelabra base bulbs (E12) - not included. Not UL. Dimensions 24.0 In. X 24.0 In. X 30.0 In.